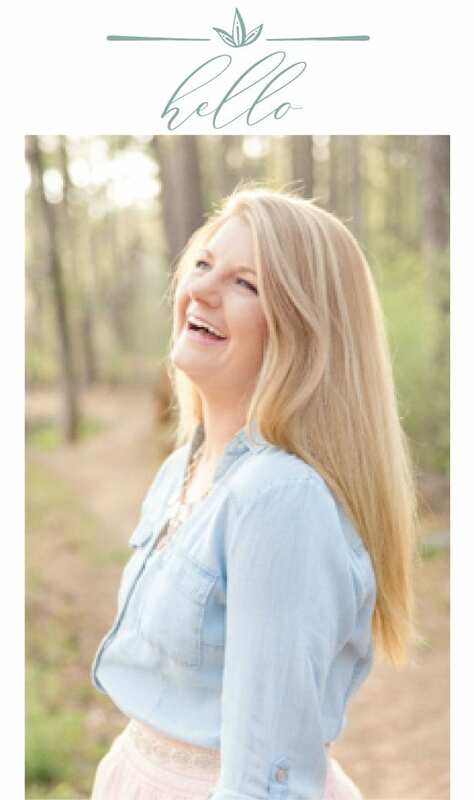 Hi y’all! 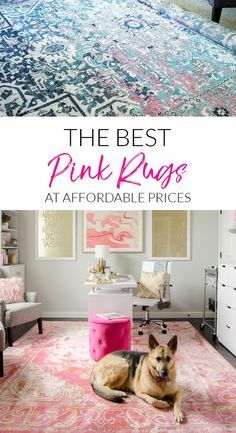 Since I’ve been in the midst of a few furniture projects, Olivia’s bedroom makeover, and gearing up for a sweet little Mother’s Day project coming up soon, I thought today would be a great time to introduce y’all to my friend, Amy! 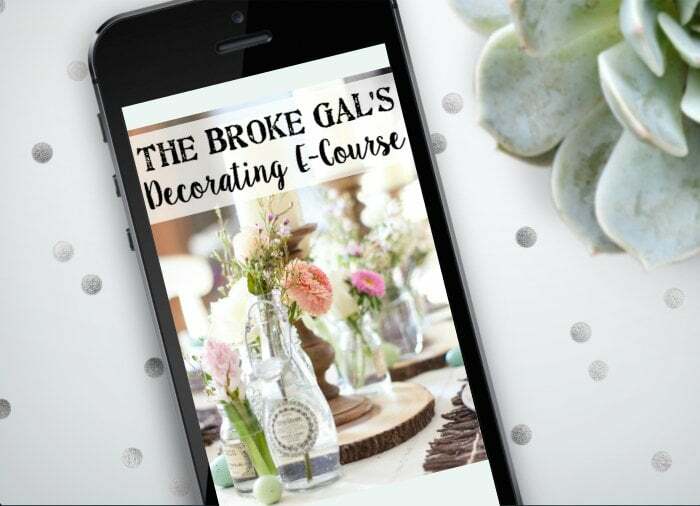 If you get a chance, check out her blog for all kinds of fun projects. 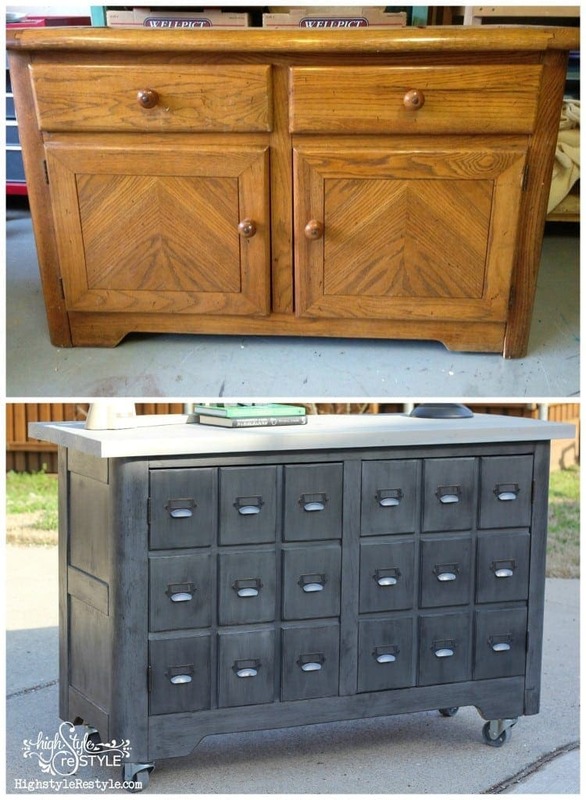 Her DIY Industrial Apothecary Cart is my favorite! 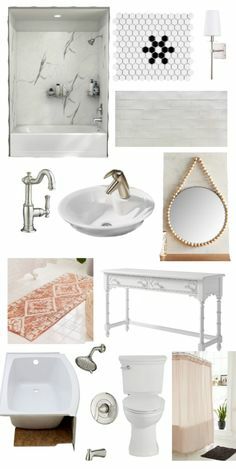 Hey there, I’m Amy from High Style Restyle and I’m so excited to be a guest here at Bless’er House. 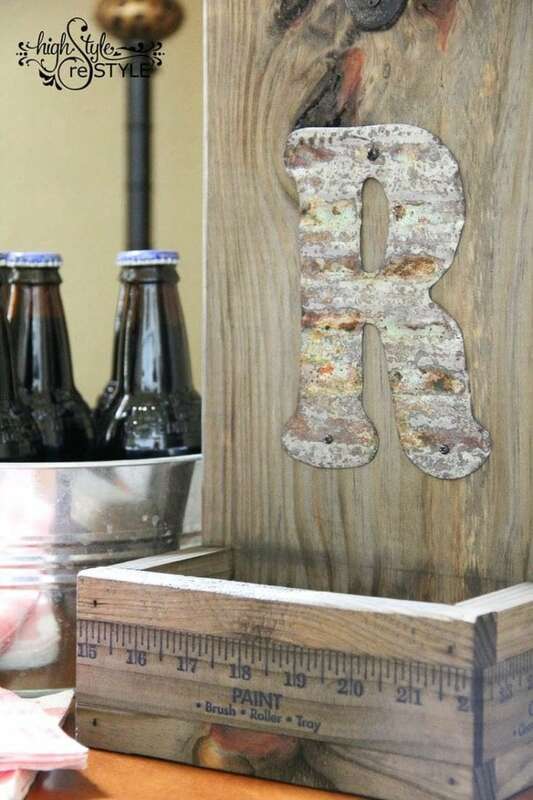 This was the perfect opportunity to share my DIY Yardstick Bottle Opener project since Father’s Day will be here before you know it. I think any dad would be thrilled to get a personalized bottle opener. 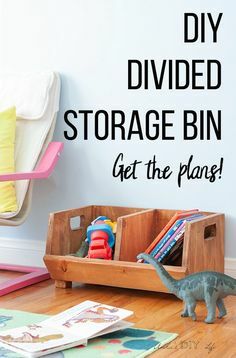 And the best part is that it’s handmade, customizable and a fast, easy project. Winning, right?! My handy, helpful, handsome, hubby, a.k.a. Triple Threat, started out by cutting the back piece of wood to 6” x 20”. 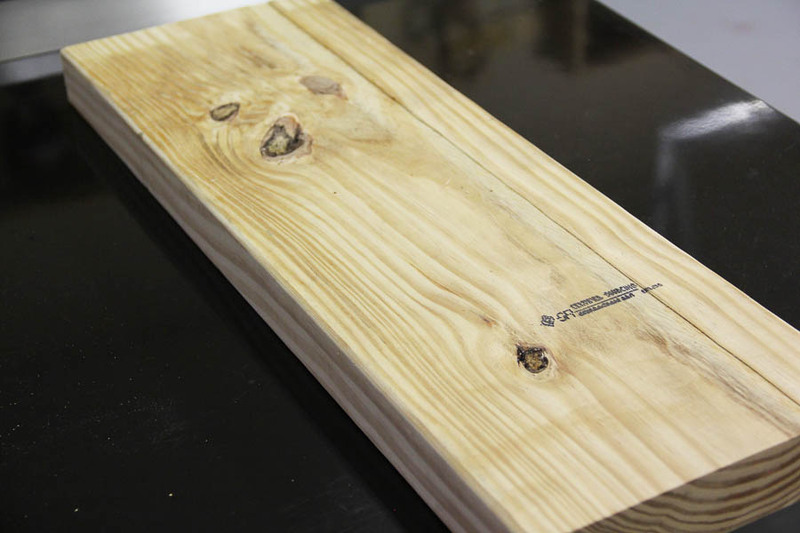 Then he ran the board through his Dewalt planer to thin to ¾ inch. Next, the two side boards were cut to 4” x 4” and the front to 6” x 4”. We wanted the yardstick to be channel set, so Triple Threat routed a groove across the center of the front and side pieces. Once the box pieces were all ready, Triple Threat used glue and brad nails to attach the sides to the back and then the front to the sides. Now it was time to cut the yardstick into the pieces needed. 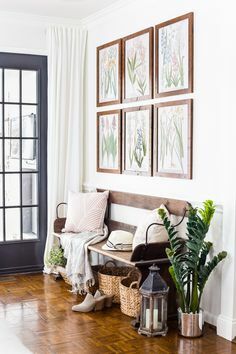 To make this easy, he simply placed the yardstick in each grove and marked exactly where to cut for a perfect fit. The miter saw made quick work of the cuts, first the front piece and then the two sides. 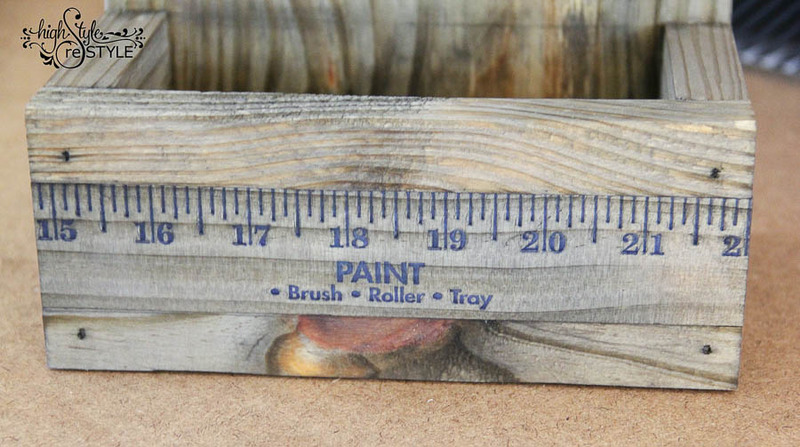 Talk about perfect cuts; look at how the Job Prep, Paint, and Clean Up sections of the yardstick are centered on each side. He used a scrap piece of ¼” plywood for the base. Just like cutting the yardstick, no tape measures required. 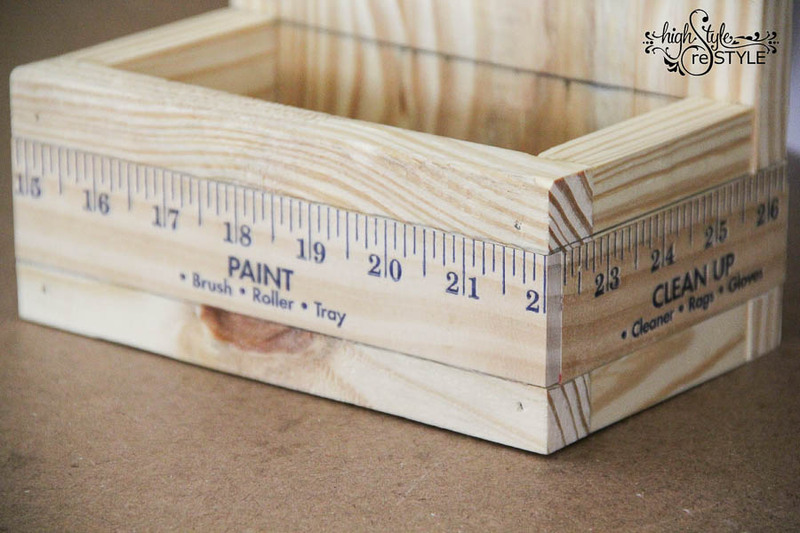 He simply set the assembled box on the plywood and marked the dimensions of the base. 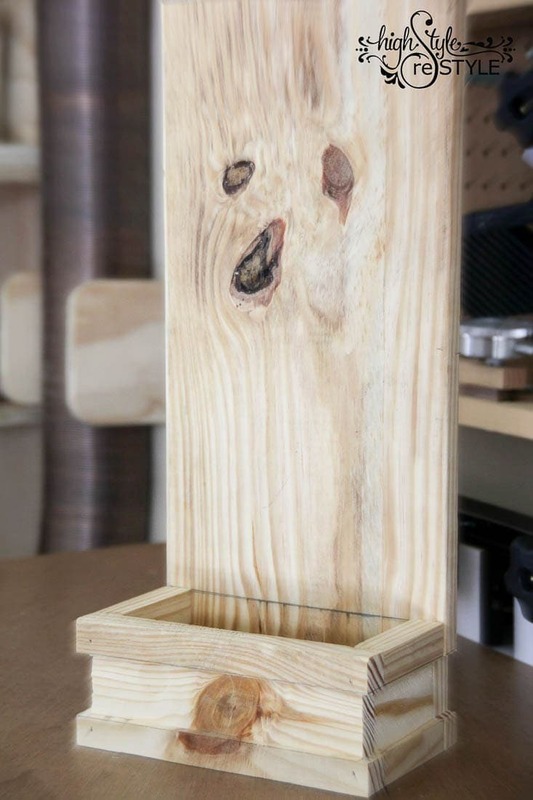 He used his Saw Stop table saw to cut out the base and then used glue and brad nails to attach it. 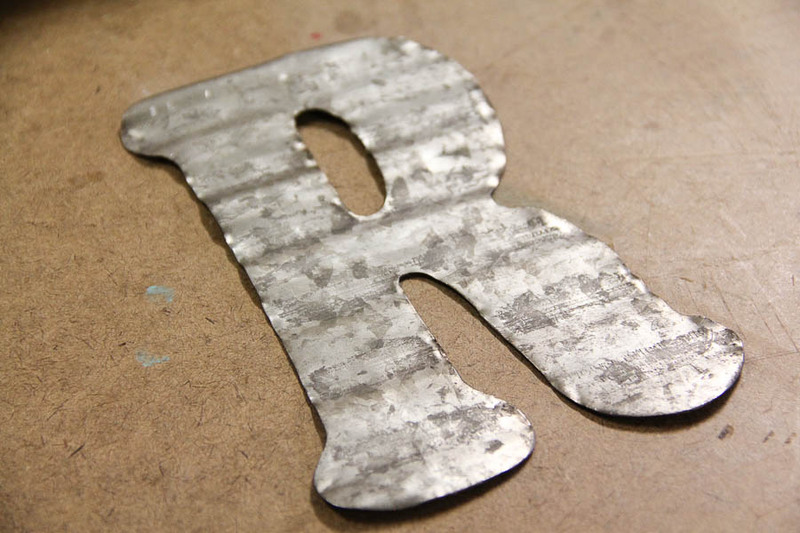 The tin letter was corrugated and it needed to lay flat so we gave it a little hammer time until it was almost smooth. To give the letter a little patina and age, I used some Modern Masters Metal Effects in rust over the entire surface. It’s super easy to apply – just mist on with a spray bottle and watch the magic happen. I’ve wanted to try the tea, steel wool and vinegar method of staining for awhile. Since I didn’t want to cover all the measurements and numbers on the yardstick, this was a perfect project to try it on! 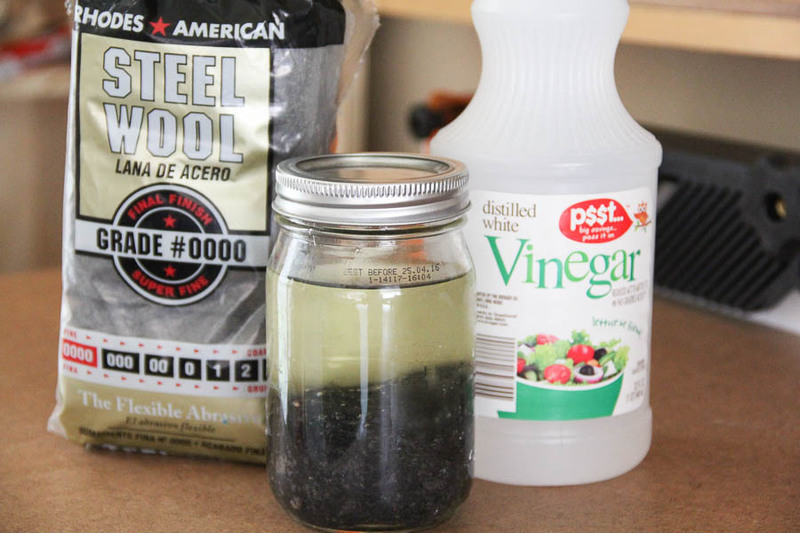 I put a piece of grade #0000 steel wool in a mason jar and filled it with white vinegar. I left it marinating overnight. The solution gets darker the longer it sits so I opted for only about 8 hours. 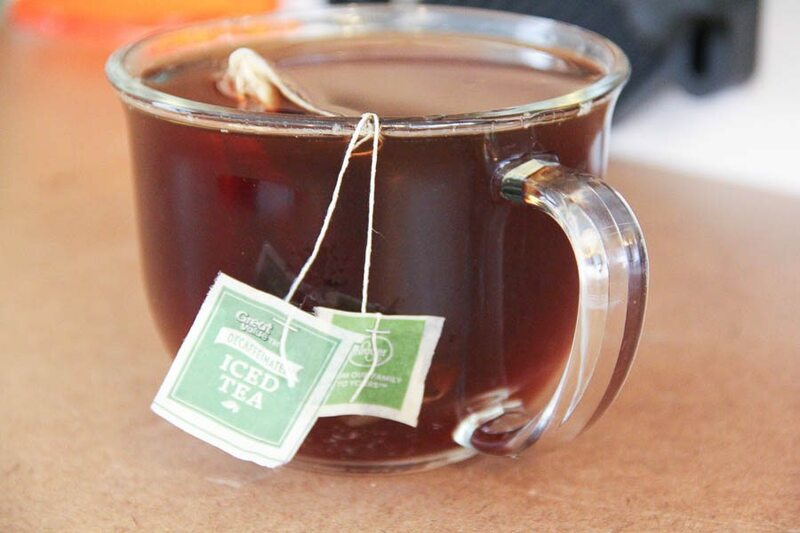 Right before I was ready to apply the vinegar solution, I brewed a small pot of tea using two family size tea bags. After letting the tea steep for about an hour, I painted tea all over the piece with a chip brush. Since tea contains tannin and pine wood lacks it, the steel wool and vinegar will react with the tea stain and darken the wood. I made sure to get in every nook and cranny, giving it a through coating of tea. Let the wood sit until completely dry. Once dry, I painted the steel wool and vinegar solution onto the wood using the same chip brush. 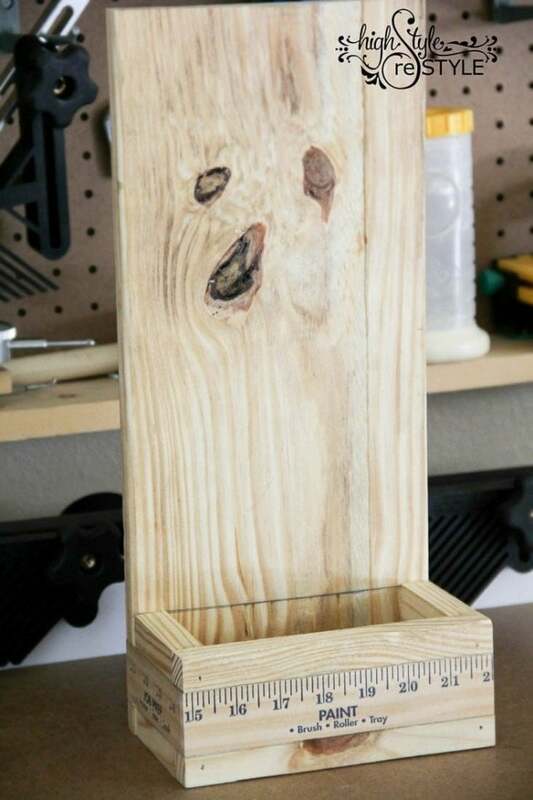 Don’t panic if the wood seems to get dark quickly. As it starts drying, I promise it will look right. 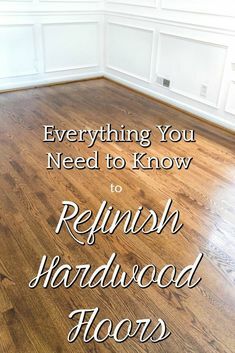 You can also apply additional coats for a darker finish. For me, one coat of the tea and vinegar solution was just right. The finishing touch was attaching the bottle opener and monogram letter. Now, it’s ready to christen with its first bottle. Cheers y’all! Since I needed Triple Threat’s help building this project, little does he know he helped build his own Father’s Day gift. Don’t worry, I have something else up my sleeve for him. 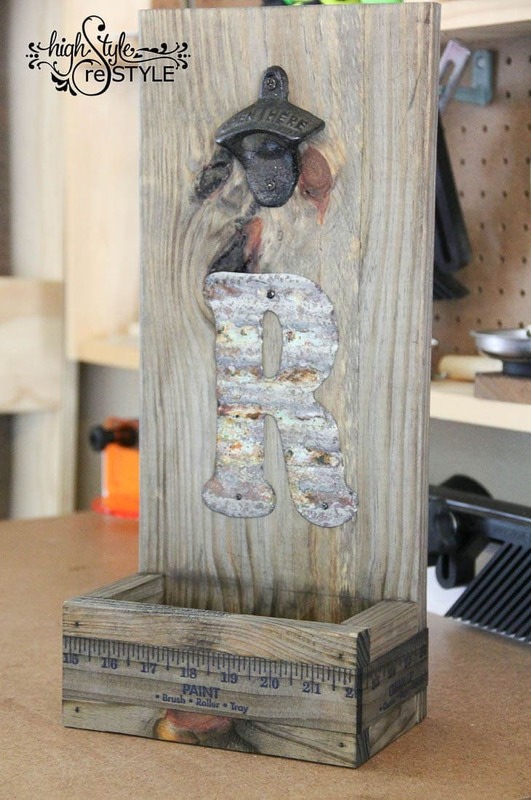 In the meantime, I’m sure he’ll enjoy getting lots of use out of the bottle opener in his workshop. 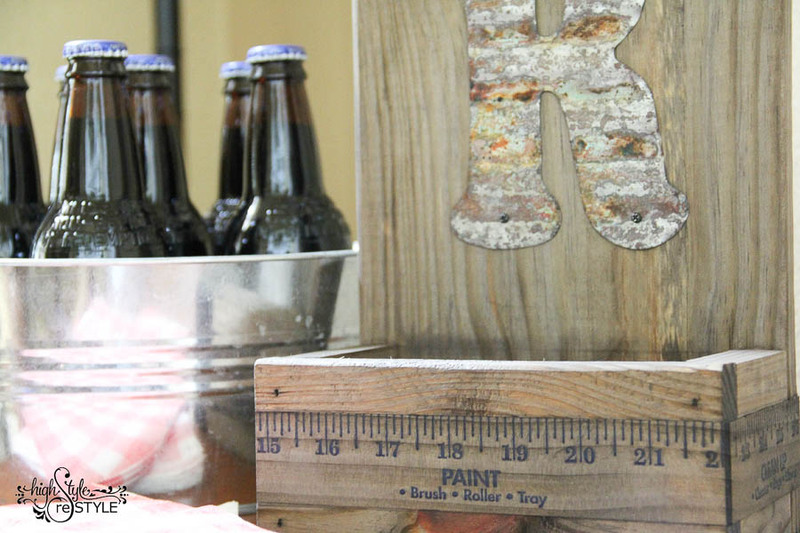 If you build your own Yardstick Bottle Opener, I hope you’ll come back and share yours with us. 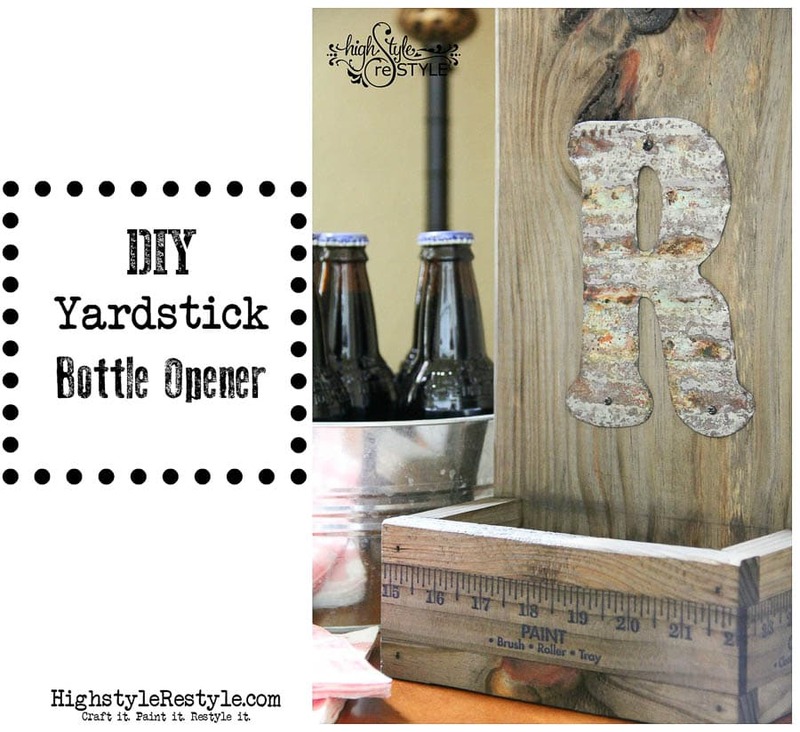 Thanks for letting me share my DIY Yardstick Bottle Opener with you! 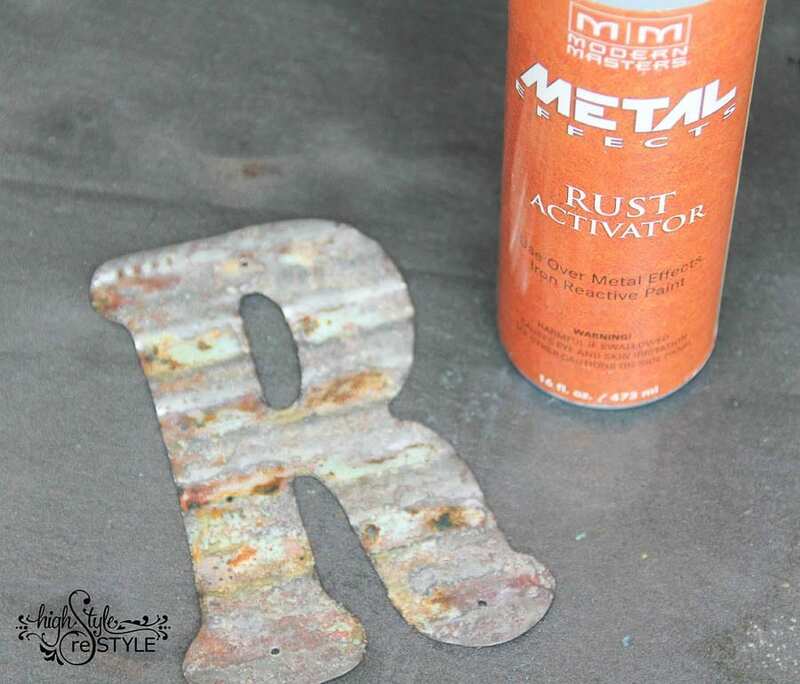 where do you get the rust spray? I need one of these bottle openers for our patio! I’ve never used the rust activator but I need a couple bottles of that too! Me too! I want to try that stuff. It looks fun!